Commercial hanging baskets with heavy gauge steel chains and hanging hooks are a brilliant choice for city, municipality and housing redevelopment projects. Large hanging baskets can also be found on college campuses, along retail storefronts and a range of other commercial exteriors. The large hanging baskets found in this collection are commercial size hanging baskets made from durable materials like fiberglass and steel. These heavy duty wrought iron hanging baskets are able to stand up to weighty planting loads and climate challenges in exterior applications. Most baskets come with coconut coir liners and optional accessories available for separate purchase like inserts or water well reservoirs. City and project planners in need of quality, commercial size hanging baskets will find their answer in this collection from Planters Unlimited. 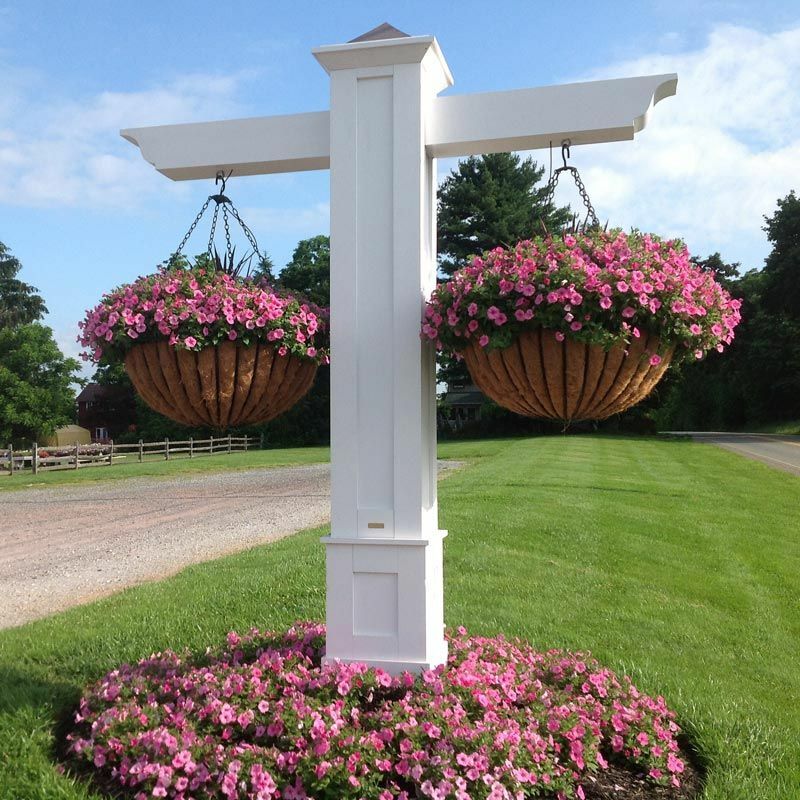 Large hanging baskets found here are made from reliable commercial grade materials like steel and fiberglass. Also, chains and hanging hooks are made from heavy gauge steel to ensure a reliable mount that can stand up to inclement weather and the other challenges of exterior placements. Available in a range of sizes, each of our heavy duty baskets are outdoor-rated and built for large planting loads. When you envision a pleasing stroll down a bustling parkway, you will no doubt see plant life as a part of the equation. In redevelopment projects for cities, municipalities and townships, flora and fauna can work wonders in increasing a warm and lively community feel. Mount large hanging baskets along street light poles, on the ends of buildings, on park posts and other areas that could use a little extra life or pop of color. Commercial size hanging baskets come lined with Coco Coir, a natural and permeable material that allows oxygen to access plant root balls and foster healthy growth of plant life. Coconut Coir Liners are compatible with a range of greenery and flowering plants from dangling vines to seasonal blooms. Fiberglass basket and liner options are also available for large hanging baskets that need to retain moisture at a higher level. Heightened moisture means plant life runs less risk of drying out, and fiberglass containers also make versatile heavy duty baskets that come in a range of custom color options. Each of the heavy duty baskets found in this category also come with the option to purchase additional accessories like supplementary inserts (beyond the already included coco coir liners) and reservoir hanging basket watering systems. Available accessories are visible via drop-down menus within individual product descriptions. Our knowledgeable customer service and project management team are available to assist with additional questions on products. We also offer individual consultation for your unique city planning or commercial design project. Please contact us at 1-800-896-0978 from 7am-5pm PST, M-F, to see what a collection of large hanging baskets can bring to your plans.